Current Transformers are primarily used to provide isolation between the main high voltage primary circuit and the secondary control and metering devices. This isolation is achieved by magnetically coupling the two circuits. The two main uses of Current Transformers are metering of current in a high voltage line and sensing faulty power conditions so as to trigger the relevant protection systems. As such, they are strategic components of the High Voltage Grid. Failure, in any form, can be very damaging and very expensive. Our Current Transformers are based on a U-shaped bushing design that incorporates HV DryShield® insulation on the primary circuit. Their totally dry, rugged and simple construction provides reliable metering and protection performance up to 600 kV and 5000A (8000A under specific conditions) without any risk of explosion or toxic leakage. The core advantage of HV DryShield® is to set and sustain a low and steady dielectric dissipation factor (tan?) 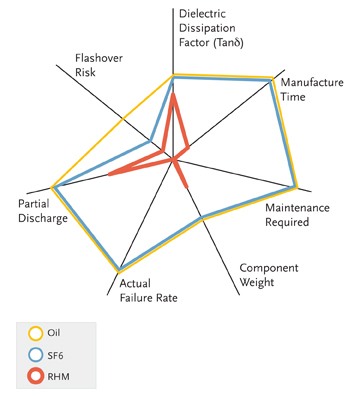 while maintaining a very low partial discharge (PD) level during field operation.